Love this so much. This would work on a full size christmas tree in addition to other ornaments, or a small stand alone tree... To see how to make the ornaments AND the star, click here. 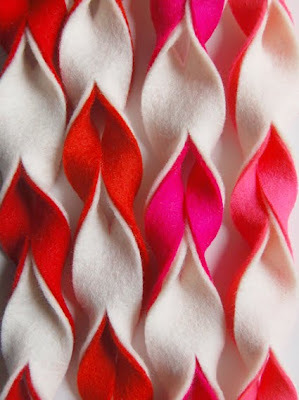 I know I said I'm not a fan of felt, but this has actually been hanging out in my "I should do this..." project queue for a while. It would be really cute draped on a tree, around garland, or pretty much anywhere! Also, it looks REALLY easy... check it out here. Speaking of trees... when I was a baby, I LOVED pulling ornaments off the tree. I'd imagine that's a situation a lot of new parents face. You can't really just have a naked tree, but at the same time you don't want broken ornaments and broken babies. My parents solved this problem by making a bunch of red bows and putting those on tree instead (and we still put some on their tree every year). I think that this is a great addition to that - a pretty felt garland with some bows. It'd make a really festive tree without anything fragile (also really, really low maintance... decorating and undecorating would take two minutes!). Yesterday I posted the felt ruffle tree tutorial by Mel over at Bliss Bloom. What I failed to notice was that she had tutorials for all of her beautiful trees. I can't wait to make the pearl one! 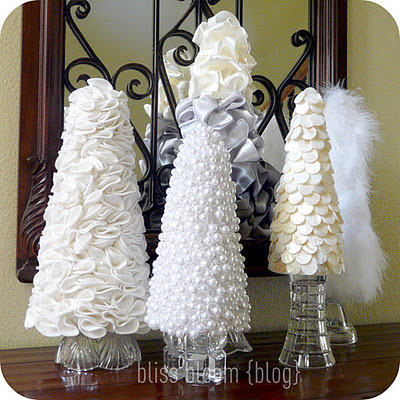 Head over to her blog to find out how to make your own beautiful christmas tree collection. I think felt always gets a bad rap in my mind. It reminds me of tacky kid crafts and tacky do it your self projects and ...well, tacky. 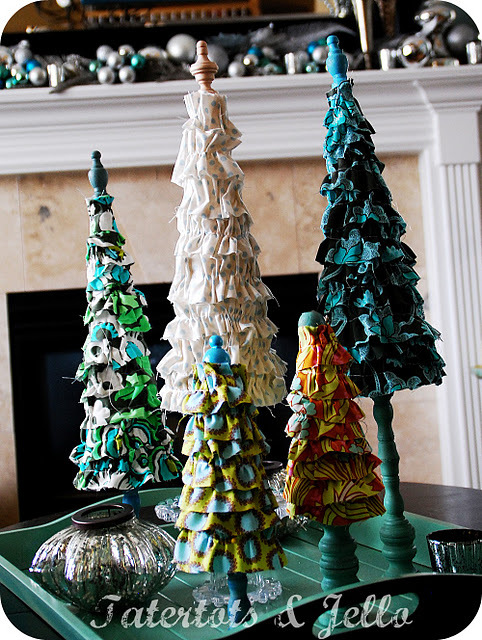 However, I found some felt trees that definitely make the non-tacky felt argument! By the way.. can you tell I love Christmas trees? Don't worry... I have some other Christmas things to post too. I love these felt glitter trees from Lorajean, but even more I love her whole mantle!! How amazingly beautiful is that? But back to the trees - these look pretty quick, easy, and beautiful. 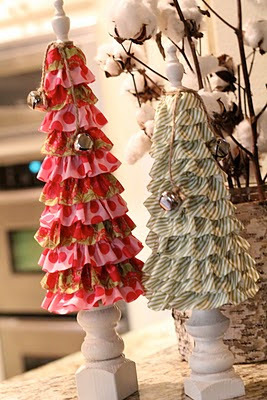 I actually made some trees similar to this but used rose petals instead of felt - I'll be posting a tutorial of that soon! This is a really awesome and unique idea... I almost made some of these, but honestly I HATE cutting out circles. Which is unfortunate, because there have been a lot of really cool circle-felt tutorials lately. I really love the pointy texture to this one - I think it might look cute next to some of the more rounded ones for a little variety on a mantle. You could do this in any color too.. I really like the idea of doing a gradient in the color. Never would have thought of that! 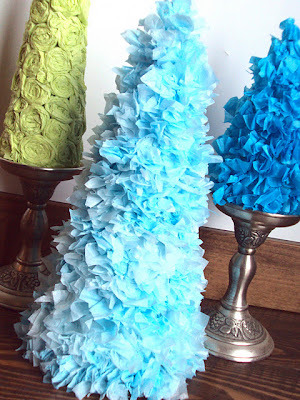 And last but not least - the ruffle felt tree! I've seen these in previous yars and always liked them.. they're so cute and fluffy! 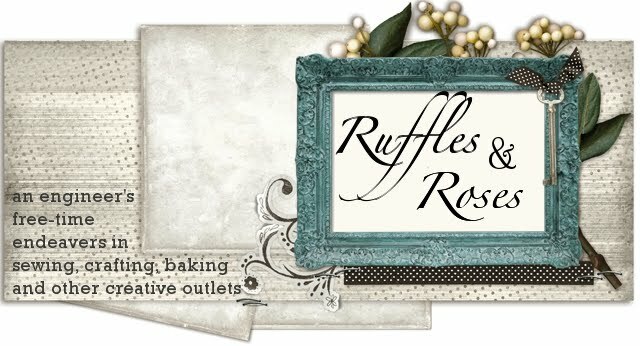 As a bonus, looking at this tutorial will also teach you how to make a ruffly wreath. 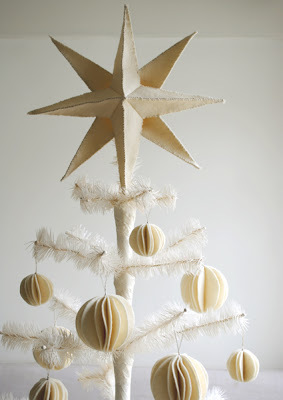 This one uses ribbon and chair railing (which is optional, for flat, un-topped tree). Check it out here. And one that uses fabrics and odds and ends as bases here. I've been saving up ome ideas for post-Thanksgiving/beginning of Christmas, so I'm excited to finally post them. I am super into Christmas. It's my favorite time of the year, and I LOVE it. Especially Christmas decorations, which can unfortunately be expensive. Since this is our first year in our own place without roommates, I really wanted to go crazy decorating... but without spending a fortune. 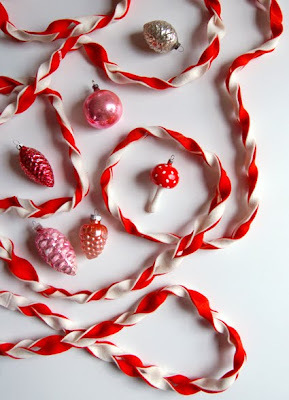 So, I turned to the internet in search of crafty Christmas tutorials. And I sure wasn't disappointed... I found some awesome ideas that I'll be sharing with you over the next few weeks - including a couple of my own tutorials slipped in which my camera man cooperates (are you reading this? You need to take pictures for me!). This tutorial is great, because it uses the cheapest thing ever - tissue paper! Tissue paper is awesome, because not only is it practically free (seriously, get it at the dollar tree), but it is fluffy and soft and can be used in all sorts of ways. This tutorial planted some tissue-paper tree ideas in my head... I might have to make a few of my own tutorials! 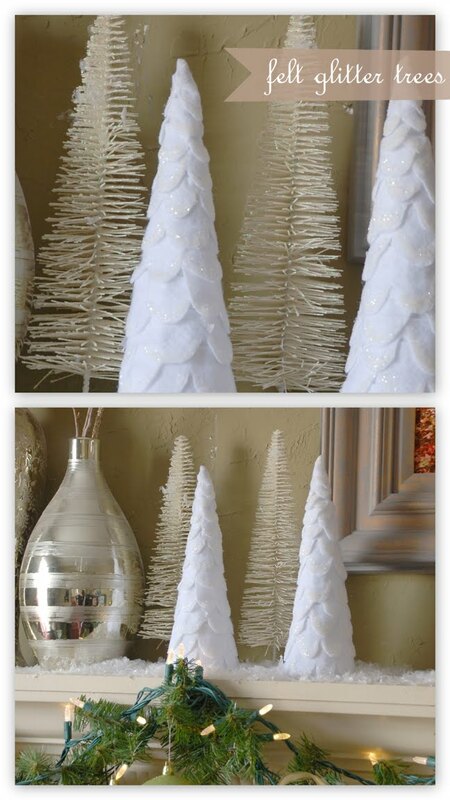 Check out Halsey's tutorial on these trees here. So... Once again, I've deserted you all. In six months I haven't posted, and I feel terrible about it. Gone, without a warning! What makes me feel really, REALLY terrible is seeing all your comments and questions that were unanswered. Let me catch you up briefly on where I've been... I've graduated from college (miraculously), am now working as a software engineer at a major company, and no longer have a gallbladder. Before I left for my surgery I set up a few autoposts, but after those ran out I just simply didn't have the energy for sewing- the rest of my life was just taking up too much of me. I'm still not quite sure what the future of this blog holds; I haven't touched my sewing machine in months, but recently inherited a serger and am trying to get both that and my sewing machine back into workable condition. After that, I have a few projects in mind. In the mean time, I would really like to continue the collabarative environment I was trying to encourage earlier in the year. For readers who value this blog and would like to see it continue, please comment and tell me what you want to see from it. Do you enjoy viewing tutorials I've found elsewhere? What about guest posts - would you be interested in doing those? Out of almost 900 (OMG) followers, and I know many of you are talented and creative, surely some of you have tutorials or projects you'd like to share with us! Please please please, keep talking to me and sending me emails. I'm making my way through the ones that came in while I was gone, and have been encouraged reading your kind words! Have an old boring sweater sitting around that could use some sprucing up? Check this out for a super quick and easy update that will make your cardigan look super sweet and feminine! Bow Shoulder Shirt - T shirt remake tutorial! I love love LOVE this, and can't wait to make one! I especially like the stripes - they set the bows off perfectly. To see how to take a cheap long sleeve t-shirt and turn it in to this, look here. 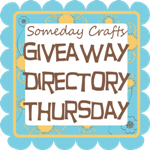 Want to be featured on my blog? Round 2! As you know, when I'm in school I don't have time to sew or post at all, which is sad and unfair! But, I really liked what I did in the past - featuring other bloggers in posts! So here's what we're going to do... I'll troll around and find tutorials that I like and repost them, AND post guest tutorials from my readers as they're submitted! So, here's the deal. If you want to be featured on this blog, come up with a great tutorial and send it to me! It should be something new that hasn't already been on your blog, but if you want me to feature something you've already done send that too! Make sure you send it to the addresses listed under the 'about me' section.